Applying for financial aid doesn't have to be confusing. You just need to follow each step along the way. NOTE: You must be admitted to the university to receive information from the Lewis University Office of Financial Aid Services. Please speak with your admission advisor to ensure you are enrolled as a degree-seeking student. for 2019-20 Academic School year. Complete the FAFSA at www.fafsa.ed.gov - Lewis University's School Code is 001707. Obtain your FSA ID number at www.fsa.ed.gov or create one at the time you complete your FAFSA. For the 2019-20 FAFSA the Department of Education is recommending that families utilize the IRS Data Retrieval Process when completing the FAFSA. The U.S. Department of Education will process your FAFSA and e-mail your results to the email address listed for the student on the FAFSA. The 2019-20 FAFSA will use the 2017 Federal Income Tax information. If you are selected for verification, additional documentation will be requested (e.g., IRS tax transcript, verification of child support, w-2's) by Lewis University. The IRS Data Retrieval process provides the student with the easiest way to meet the verification requirements for income. Students can also upload any documentation to Financial Aid Office directly on their myLewis portal. NOTE: If you owe federal taxes on a filed tax return, you will be unable to utilize the IRS data retrieval process until April 15. A Financial Aid Award Letter will be sent to the student. The award letter outlines all financial aid, for which the student is eligible during the academic year. Accept your Financial Aid Award Letter online at myLewis.lewisu.edu. The Award Letter Guide is available in a pdf under the Forms section of the Financial Aid site. Complete the Entrance Counseling and Direct Stafford Loan Master Promissory Note (MPN). Here is a step-by-step guide to completing the documents. Note: Entrance Counseling, Direct Stafford Loan MPN, Parent PLUS Application, Parent PLUS MPN, Grad PLUS Application, and Grad PLUS MPN are completed on the same website. 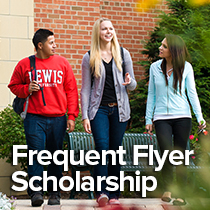 "The financial aid counselors at Lewis University were so helpful. They really helped me understand my options, and gave me practical advice I would have never thought of myself."